Google, Apple, Intel and Adobe have settled a class-action lawsuit alleging they conspired to prevent their engineers and highly sought technology workers from getting better job offers from one another. 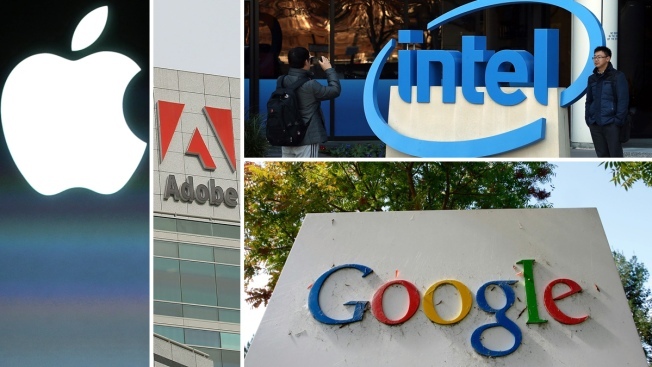 Google, Apple, Intel and Adobe have settled a class-action lawsuit that alleged they'd colluded to prevent their highly sought-after tech workers from getting better job offers from one another, suppressing their wages as well as aggressive recruitment. The agreement announced Thursday averts a Silicon Valley trial that threatened to expose the tactics deployed by billionaire executives such as late Apple Inc. CEO Steve Jobs and former Google Inc. CEO Eric Schmidt to corral less affluent employees working on a variety of products and online services. Had they lost, the companies also faced the prospect of paying as much as $9 billion. The amount of the settlement won't be revealed until the deal is filed in court, no later than May 27, when the trial had been set to start in San Jose. "We think it's an excellent result for the class, and we look forward to presenting it to them," Kelly Dermody of Lieff Cabraser Heimann & Bernstein, lead counsel for the plaintiffs, told NBC Bay Area. Google and its lead counsel Robert Van Nest declined to comment on the settlement, and the law firm that represented Apple declined to comment. Both Intel and Adobe said they had settled the suit to avoid the costs associated with it but continue to deny any wrongdoing. "We firmly believe that our recruiting policies have in no way diminished competition for talent in the marketplace," Adobe added in a statement. An Intel spokesman declined to comment on the settlement pending its court approval. The suit, which grew out of an earlier Justice Department investigation, was seeking $3 billion in damages on behalf of 64,600 workers employed at some point from 2005 through 2009. Had damages been awarded in trial, they could have been tripled under antitrust laws forbidding U.S. companies from engaging in behavior that suppresses a free market. A $9 billion award would have translated into an average of nearly $140,000 per worker. Programmers, software developers and computer scientists make an average of $80,000 to $110,000 annually, depending on their specific duties, according to the latest wage data from the U.S. Department of Labor. Some of the aggrieved employees in the class-action lawsuit worked at software maker Intuit Inc., and two filmmakers now owned by Walt Disney Co., Pixar Animation and Lucasfilm. Intuit, Pixar and Lucasfilm had previously negotiated a $20 million settlement of the claims against them. That settlement is still in the process of being approved by the courts. The 3-year-old case revolves around a "gentlemen's agreement" that the plaintiffs claimed the companies forged to retain employees. Internal emails excavated during the pre-trial proceedings showed Google, Apple and other major technology employers agreed not to recruit each other's workers to help protect their own interests. The companies maintained that the "no-poaching" cartel wasn't illegal because they still could hire employees from their partners in the arrangement, as long as the workers initiated the inquiries about vacant positions. But documents that had been surfacing in the case painted a more sordid picture. Google, in particular, seemed especially leery of approaching Apple employees for fear of infuriating the mercurial Jobs, who had warned the company not to raid his workforce. At one point in 2006, Google sought Jobs' permission to hire a respected programmer, Jean-Marie Hullot, to run a new engineering office in Paris even though Hullot had already resigned from Apple, according to emails turned over in the case. Google also wanted to hire some other former Apple engineers that formerly worked with Hullot. After some email negotiations about what Hullot and his colleague would be working on at Google, Jobs wrote, "We'd strongly prefer that you not hire these guys." Google then backed off its Paris plans, according to emails. In another instance, Schmidt fired a Google recruiter who riled Jobs by contacting an Apple employee about a job opening. After being informed of the firing, Jobs responded with a smiley face in an email. Jobs died in October 2011 after a long battle with cancer. Attorneys representing the employers had been trying to limit how much evidence could be presented about Jobs' management philosophy, including statements he made to biographer Walter Isaacson, if the case had gone to trial. Schmidt, a former Apple board member, ended a decade-long stint as Google's CEO in 2011, but remains the company's executive chairman. Earlier this year, Google awarded Schmidt restricted stock valued at $100 million to supplement a fortune estimated at $8.6 billion by Forbes magazine. Google also attempted to persuade one of its former executives, Sheryl Sandberg, to join the no-poaching pact after she became Facebook's chief operating officer in 2008. Sandberg refused to play along and Facebook continued to recruit Google employees, according to a sworn deposition that she provided in the case. The no-poaching agreement among the tech companies had also triggered a separate 2009 antitrust investigation by the U.S. Justice Department. That resulted in a 2010 settlement that requiring Google, Apple, Intel, Adobe Systems and several companies to scrap their no-poaching agreements. None of the companies acknowledged wrongdoing.